Wakonyu Orphans Project is a community based project dedicated to helping families that have generously adopted AIDS orphans. It is the Kenyan arm of an international effort. The Dutch arm is called “OMA-PROJECT”. Wakonyu Orphans Project supports over 1500 children 600 of whom are adopted Aids orphans. We work closely with the local communities to find lasting ways to improve the lives of poor children and families. Kindly watch this short video in which the staff of Wakonyu tells something about the idea behind Wakonyu and our execution of the plan. Families suffer heavily when parents die of AIDS. The orphans often find a place in the extended family. But there too the AIDS epidemic continues to cause havoc, until the poor grandmother is often the only one left. In 2007 Mrs. Lidy Burgman-Haarhuis, one of the Friends of Pandipieri in Holland, heard about a Ugandan initiative to help such grandmothers with goats, suppliers of milk, young goats and meat. She felt sure that such a project would attract a lot of help. She took up contact with her brother-in-law Fr. Hans Burgman, who had been involved in the Kisumu Urban Apostolate since 1977, to see if such a plan could work in Kisumu. A parochial committee studied the situation more in depth. A first count showed at least twelve hundred orphans. They had been adopted by some five hundred families. Three hundred of these families had a grandmother at the head; in twelve cases a child was the head of the family. By charting the most urgent needs we found that medical care was a heavy burden. We discovered that there were cheap insurances: for fifty-five Euros per year a whole family – two parents and five children – could be insured against all hospital expenses. We decided to go for that. Treatment in a clinic was not covered; but in our own Pandipieri clinic a capital could be built up from which the orphans would get free treatment. We made a deal with an insurance company (NHIF). They agreed that we could include also non-biological children. With that we appeared to break new ground in the whole of Kenya. They even increased the number of children allowed. The marvelous thing with this project is that not only are the orphans helped, but their guardians are also rewarded with free hospital care. Wondering why the insurance could be so cheap, we were told that the government want to make insurances more popular with the people. True, health insurances are not often taken out voluntarily. Indeed, you have to pay the premium; and if then you are unlucky enough to remain healthy, then you have paid the money for nothing. So, our plan implied a cultural break-through as well. Wakonyu was forced to reduce the number of beneficiaries from 290 to 55 families. This number has reduced tremendously due to the increase in costs of medical insurance. 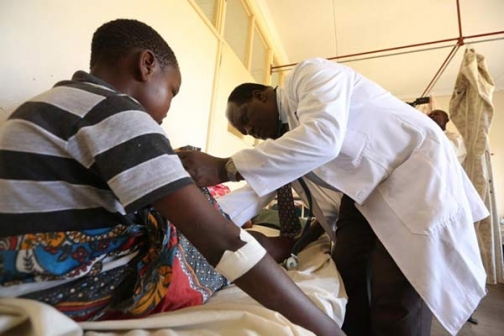 A health insurance now costs 500 kenyan shillings instead of the initial 160 shillings. The donor funding has reduced as well. There are still very many families that need our help and our mission is to ensure the number of our beneficiaries increases. This way we are able to realize our mission of restoration of life and hope to more aged guardians and adopted HIV/AIDS orphans. One of our local partners Howic Hospital sponsors ten of our beneficiaries. We are at the moment in discussion with our other partnering hospitals to see whether they are able to contribute some capital as well.